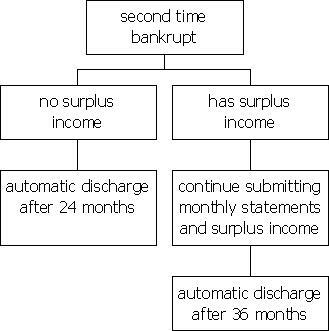 If you have been bankrupt once before, and have no surplus income, you will be eligible for an automatic discharge from bankruptcy after 24 months, provided that all duties required have been completed. The cost to file a second bankruptcy will be slightly higher than the first time. If your income is below a certain threshold and you do not have any surplus income requirements, the cost of a basic second bankruptcy will be $3,600, paid in monthly installments of $150 over the 24-month period of bankruptcy. Where you are required to pay surplus income during your second bankruptcy, this period of bankruptcy will be extended from 24 months to 36 months before you are eligible to receive an automatic discharge. If you decide to file a second bankruptcy you do not need to use the same Licensed Insolvency Trustee (formerly called a Bankruptcy Trustee) that you did the first time. Simply call Sands & Associates toll-free at 1-800-661-3030 to set up a free and confidential meeting to talk about your situation and how we can help you. Many people who are struggling with debt and considering a second (or third) bankruptcy may find a Consumer Proposal is actually a better solution. This alternative allows them to clear their debt using a totally different legal process which avoids the need for another bankruptcy filing. The credit rating impact of a Consumer Proposal can be significantly better than the impact of filing a second bankruptcy. Learn more about Consumer Proposals that a Licensed Insolvency Trustee can file for you.